Over the years the Punahou Carnival has grown to become the dominant school fun raising event in the state of Hawaii. For years it has generated money to support scholarships, building drives, and even graduation events for the senior class. 1973 Punahou Carnival Map. The grounds were more confined then. Note the initials in the lower right hand corner. Is “JS” Jeff Sia? Lori Yee in a smock top from the Teen Boutique of the Arts & Crafts booth. Note: All photos are by Mazeppa Costa (Monte Costa’s mother). 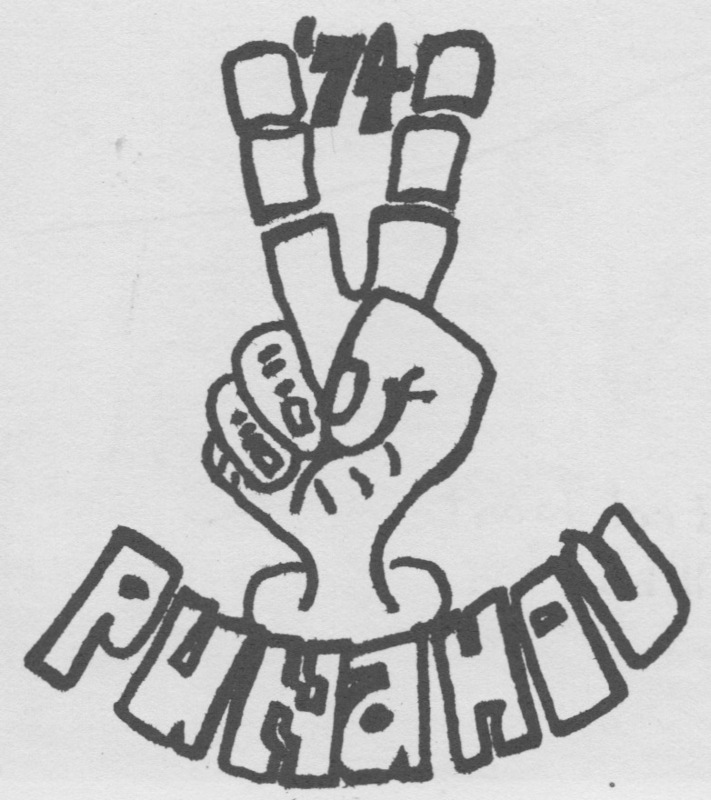 To understand the reaction of the recent returnee, I’d like to take a look back over the swath of time to 40 years ago when Punahou74 ruled and ran the Carnival. Compare Carnival 1973 to Carnival 2013. You’ll see that there have been quite a few changes since then! (By Mazeppa Costa) Shortly after the New Year holidays every year, a massive network of community volunteers swings into action to produce the annual Punahou Carnival, which is set this year for Fri. and Sat. (Feb. 9 and 10). This is an event which is staged by the junior class and their parents–plus everybody else they can get into the act. No one has ever been able to compile a list of all the people involved or even to count those who help in some way. But these volunteers number in the thousands. And their contribution to the community is considerable. Money that is raised during the two days of the Carnival now exceeds $100,000 annually. James Frank shows off some of the Carnival jams and jellies. That year the booth featured 22 varieties including carissa (natal plum) lilikoi, lime, mulberry, pepper, roselle, and surinam jellies. Also carambola (star fruit) pickle, papaya-Chinese orange jam, pineapple-ginger jam, spiced pineapple, spiced mango, mango relish, and several guava goodies. Mango chutney? Of course, that too! This year two of the five division chairmen of the Carnival are from the Japanese community. They are Mrs. Hiroshi Yamani (sic, Yamane) and Mrs. Unoji Goto. The Carnival will have a two-day run, Friday and Saturday, from 11:30 a.m. to 11:30 p.m. both days. It will feature more than 60 midway attractions including many popular E.K. Fernandez rides, lots of skill games, arts and crafts, a teen boutique, plus the thrills and chills of the curdling crypt. The art gallery will feature paintings, prints, woodcuts, sculpture, ceramics, jewelry, and batiks representing more than 150 of Honolulu’s outstanding artists including Hiroshi Tagami, Peter Kobayashi, Sunao Hironaka, and Joan Gima. The plant booth will beckon green thumb artists with potted ornamentals, fruit trees, succulents, ground covers, orchids, herbs, cuttings, hanging baskets, and unusual plumerias (sic). But food is the backbone of any carnival and this one is no exception. Such Island favorites as shave-ice, saimin, meat sticks, teriyaki, and sushi will probably outsell hot dogs, hamburgers, and cotton candy. For health food enthusiasts there will be a natural foods booth. A Chinese dinner will be available at Dole Hall Friday night with a succulent poi supper Saturday evening. Serving time will be 5:30 to 8:30 p.m.
For everyone with a sweet tooth there will be 10,000 jars of jams and jellies, in 22 different varieties. Barggain hunters can have a field day at the giant white elephant tent which will bulge with literally tons of books, clothing, knicknacks, records, toys and special “treasures,” all at giveaway prices. Other services will include baby sitting and checking. Who were the students who ran the Carnival itself? Here they are along with the functions that they managed. Gives you feel for the all-out class effort that was required. Remember that many of our parents answered the Carnival call as well. Lisa Matsumoto shows simple exotics to be sold at plant booth. Ralph Aona and Marie Mookini were the overall student Carnival chairs. Bev Ashford, Bruce’s mother, was the overall parent chairman. Administrative Division: Burke Zen and Willie Kawashima (Purchasing), Paul Goto, Jonelson Cheng, Patrice Ching and Sharon Himeno (Student Booth Workers), Kimm Hall and Alan Takane (Special Sales), Mary Jane Markoskie and Linda de Silva (Thanksgiving Pie Sale), Liane Nip and Heather Miura (Pre-Christmas Sale), Thora Tokioka and Jean Alexander (Pre-Carnival Bake Sale), Randi Pittman (Publicity), Heidi Huckins and Warren Loui (Ride Tickets #1-13), Ted Lau and Wilma Wong (Scrip Selling), Lori Ranada, Rosemarie Wong and Kathy Shiraki (Signs), Jonette Kamai and Cathy Creveling (Curdling Crypt). Food Division: Lynn Tanoue and Kalfred Wong (Division Chairmen), Laurie Ching and Bert Lau (Cold Drinks), Ted Sugihara and Fay Imamura (Corn), Kris Hansen and Maile Mobberly (Cotton Candy), Mike Green, Earl Nakaya, and John Fink (Transportation), Io Phillips and Betsy Abts (Friday Night Dinner), Faith Sereno and Alton Komori (Ewa Hamburgers), Roy Tsuchida and Lynne Obatake (Waikiki Hamburgers), Vernon Yee and Jade Wong (Hot Dogs), Carlyle Castle and Neal Higgins (Ride Midway Ice Cream), Renee Blondin and David Apo (Waikiki Ice Cream), Patty Frederick, Bryann Bromley and Kathy MacDonald (Malasadas and Coffee – one booth only in 1973), Joyce Kato, Kelly Nakano and Fred Frizelle (Meatsticks and Saimin), Ann Harakawa and Timmy Chinn (Natural Foods), Cathy Kam (Pie Making), Sharon Loomis (Pie Selling), Keith Kam and Molly Gunther (Pizza), Wendy Wichman and Martha Rietow (Sandwiches), Mary Madinger and Julie Onna (Saturday Night Dinner), Craig Leong and Ellen Goldstein (Shaved Ice), Harvey Lung and Lisa Yamaguchi (Teriyaki Sandwiches). Ross Fujimoto paints a giant beetle on the comely shoulder of Coralie Chun. More than 60 student artists provided fanciful body paint to Carnival attendees. Skills Games Division: Jay Higgins and Lisa Matsumoto (Division Chairmen), Gaye Miyasaki and Craig Harada (Prizes), Cathy Field and Bill Richardson (Baseball), Gene Lau and Eleanor Bell (Basketball), Bean Bag (Charles Loomis and Nancy Dew), Bruce Chinn and Grace House (Ewa Bowling), Lynne Tsuda and Brenda Dang (Waikiki Bowling), Lynnette Lo and Warren Chaiko (Fish Bowl), Jackie Ching and Sandy Doo (Fish Swish), Meredith Chuck and Peter Robinson (Golf Ball Maze), Warren Karkosza and Deanie Kuwasaki (Golf Putting), Carolyn Ing and Gail Ikinaga (Grab Bag), Mike Yokoyama and Robin Haws (Instant Art), Rosanne Mandel and Lynne Gartley (Penny Toss), Gail Mulholland and Bruce Ashford (Record Smash), Shoji Ledward and Fred Hu (Rifle), Mele Meyer and Bill Price (Ring Toss), Carrie Chang and Roy Rathburn (Splat Trap), Waiau Kaulukukui and Marlene Hsi (Tether Ball), Ann Yoshida and Bert Takushi (Tic Tac Toe). Specialties Division: Shari Moore (Division Chairman), Debbie Withans and Kimberly Allen (Art Gallery), Gail Gronau and Howie Bond (Arts & Crafts), Sharon Uyeda and Lori Yee (Teen Boutique), Ross Fujimoto and Jim Howeton (Body Painting), Pat Frazier and Haven Young (Checking), Anne Hogan and David Ladd (Jams & Jellies), Debra Pang and Mark Fukunaga (Plants), Greg Cassidy, Heidi Smyser and Richard Botkin (Sound Booth), Susan Fukuhara and Debbie Kawamura (Baby Sitting Service). Another great post – Mahalo! The last picture is of Rick (Ric?) Martin (not Class of 73 Rick Martin that played drums). I can’t remember when he left – however, he played sax and was the only/first 7th grader in Fordham’s marching band. He came back from the mainland to visit for our Jr. year carnival. The last photo is of Rick Martin, who was our classmate during our intermediate school years and then left for the mainland. He returned just to be at the Carnival our Junior year (he stayed at my house). Rick played guitar as he and I attempted to start a rock band in 8th Grade and would practice at his house in Wailupe. The drawing of the Carnival grounds was from the Ka Punahou’s Carnival edition, and I did draw it, although it was based on a general map of lower campus that I used as a guide. Jim Simpson was our resident artist/cartoonist for Ka Punahou and I only can assume that he was busy or it was a last minute insertion into the paper because my handwriting was/is not very appealing. That would be super!!! There is so little there for Punahou74 and the fabric would sure be appreciated.